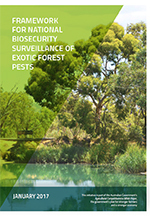 Nationally coordinated surveillance programs, supported by an effective diagnostic network, are needed to maximise the effectiveness and efficiency of detection of exotic forest pests, mitigate the risk of exotic forest pests establishing in Australia, and provide evidence to support claims of area freedom. Ensuring that forest stakeholders and government agencies work together in partnership is critical to achieving these aims. 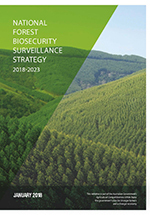 The National Forest Biosecurity Surveillance Strategy is designed to complement and address aspects of the National Plant Biosecurity Strategy, the National Plant Biosecurity Surveillance Strategy and the National Plant Biosecurity Diagnostic Strategy for the forest biosecurity sector. A series of goals and actions with defined outcomes are described to enable stakeholders to successfully establish a National Forest Pest Surveillance Program over five years. Funding for the development of this strategy comes from the Australian Government’s Agricultural Competitiveness White Paper, the government’s plan for stronger farmers and a stronger economy. To achieve the objectives, goals and outcomes outlined in the above strategy, the NFBSS Implementation Plan suggests ten major actions with a total of 30 associated tasks, undertaken over five years, for consideration by forest stakeholders and governments. Implementation of the NFBSS will support the sustainability of Australia’s forests and provide information on pest status that underpins market access for forest derived products. This Framework recognises the need to effectively gather together and engage the multitude of stakeholders in the forest sector to drive fair investment in forest biosecurity. 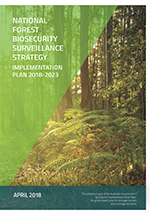 The recommendations outline a system wherein the forest sector would, where appropriate, provide funding, in-kind operational support or forest-specific expertise to assist or undertake the activities along Australia’s biosecurity continuum.